For piccies, games played, and an overview of FATDOG 2017 see the following article. I will post a similar AAR on DOGCAT 2 soon. After some worrying times, that lacked the cylony goodness known as Battlestar Galactica, I am back on track to complete my 10×10 Challenge for 2017. Two more games of Battlestar Galactica are all that is required to complete the challenge. So Say We Al! The second week of April was a good week with two evenings and one day sacrificed to the cardboard gods. I know I am a little late in posting this, but I did not have time to finish this post before I rushed off to a probable once in a lifetime chance to see a flying condition Boeing B-29. The day after that I went off to the twice-a-year GMT West Weekend at the Warehouse. I got back yesterday, and I have still not yet recovered. So, kindly cast you mind back to the second week of April. Greg, our gracious host every Tuesday, had arranged a game of Britannia with Sudro, and Jon Cassie. With the week being Spring Break it was a good time for Jon to attend as he now lives in the depths of L.A. However, domestic obligations intervened meaning that Greg was not available to host on Tuesday. Some quick reorganization was in order. Fortunately, Ted was able to host on Tuesday, but it meant the plan for the Britannia game had come awry, and some brainstorming occurred to reschedule the game. Monday night was soon agreed as an replacement time. As Greg was opening his offices for one game, why stop there? I immediately suggested we open the opportunity up to the whole group as a special Monday night meetup. Game On! We had never had a meetup on a Monday before, so I was interested in how popular it would be, especially compared to the regular Tuesday meetup. By happenstance, fellow West Countryman Dominic was looking for a game of High Frontier, a complicated and notoriously unforgiving space exploration game. In his own words, the game had “eaten his head”. It is hard to explain to a non-gamer the feeling when a game gets into your head that way. It’s a niggling, gnawing feeling, a mental itch that must be scratched. For some games it is good idea to publicize in advance to garner interest. With a few volunteers interested in learning High Frontier we dragged Dominic came along to Greg’s offices for the first time. Monday went off well, with 17 in attendance. The game played included: Clank + expansion, Love Letter, Archer love Letter, High Frontier, Britannia, Oracle of Delphi, Broom Service, Paperback, Nations: Dice Game, Concordia + expansion, and Privateer. High Frontier had four players who like the more cerebral type of games. I have wanted to tackle High Frontier for a while, but the complexity of the rules, and the subject of the game have put me off from jumping in blind. Now that I know there is an experienced teacher close by, well, it might be time to take the plunge. With Ted hosting on Tuesday we have a capacity limit of 24 people across 5 tables. As expected we hit the limit, then had a few drop out. That is fine, as it meant that we do not need to bring along as many extra chairs. Along with copious quantities of rum, Ted has over 15 chairs and a mix of tables. Games played included: Ivanhoe, A Feast For Odin, Star Wars Rebellion, 7 Wonders, Terraforming Mars, Hero Realms, Wizard x2, Clank + Expansion, Smash Up!, Castles of Mad King Ludwig, Secret Hitler x2, Cacao, And The Grizzled. A regular game repeat game on Tuesdays has been Star Wars Rebellion. We not enough for a game of Battlestar Galactica I joined in with this games as they had space. It’s a 2-4 player cat and mouse game based on the original Star Wars films. Chris played the senior partner in our rebel side, with Josh B. and Dodgy John acting as the Empire. It is an interesting counter insurgency game, where the Rebels are outnumbered and have to use guile, and sabotage to delay the Empire. The force was not with us as our dice luck repeatedly failed us. We should have moved the Rebel base, but we did not. We might have won if we had moved the base. C’est la Vie. Ted’s infatuation with Terraforming Mars continues, after playing on Tuesday night he hosted a gaming session on Easter Sunday and played the game three times. The night before he had hosted his Saturday Traditional Card games group too. Well done Ted. Saturday came around quickly. The third Saturday of each month is a regular get together with a bunch of lads at Game Empire in Pasadena. This is an opportunity to play wargames, games with a strong historical basis. A few games were discussed in advance including the new game Pericles by GMT. I went looking for a two-player magazine wargame called 1914 Race to the Sea. As you may be able to tell from the game title, it is a game on a campaign of World War One. It’s a fun dice-less game where cards determine how much damage your units take. As about 5 lads were expected to attend I was hoping it could hit the table. Anyway I digress, I looked for the game on my Kallax shelves and it was nowhere to be seen. I then assumed that it was in the boot of the car. Off I went to Pasadena looking forward to playing some games. Arriving early, to make sure I had a good parking space, I leisurely looked for 1914 Race to the Sea. It was nowhere to be seen. I looked in the car again, and still there was no sign of the small package containing that confounded game. Rats! Despite the lack of that one game we had a good day of gaming. We started with Ivanhoe as a meaty filler, followed by a scenario from Pericles as a teaching game. Pericles was interesting, a game where there are two on each side, but only one of the two wins the game.We need to read the rules again, but the second of the two turns went much quicker. We all saw that this game had great potential. After Pericles, we went for a short and fun session of two games of Clank!. My Ikea Kallax shelves have gone from tidy, to disorganized in a short period. These shelves hold my short term storage. These are are games that I want at hand because I want to get at them quickly without having to hunt through boxes etc. It is only know that I have found two weaknesses with this storage style. Unlike many bookcases, the Kallax cubes have no back. This means there is no backstop panel to keep things from slipping behind the Kallax if it is not directly against the wall. Most rooms have skirting boards, while the Kallax does not a cut-out for the skirting board. The rear of the Kallax is not in contact with the wall. Be aware that things can fall behind the Kallax, especially if you put things on the top surface. The Kallax often rests on the floor. If you want to look at all of the contents of the floor level cubes you must lie down on the floor. The Kallax cubes are deep, this is both good and bad. My 1914 Race To Sea game had been pushed back in the cube so it could only be seen when I lay down on the floor directly in front of the cube it was in. The game was simply hiding from me. The lesson I had learned was to not place small games on the lowest level of the Kallax. This is the latest update to my (Battlestar Galactica) heavy 10×10 challenge. The status is up to 5th of March 2017. 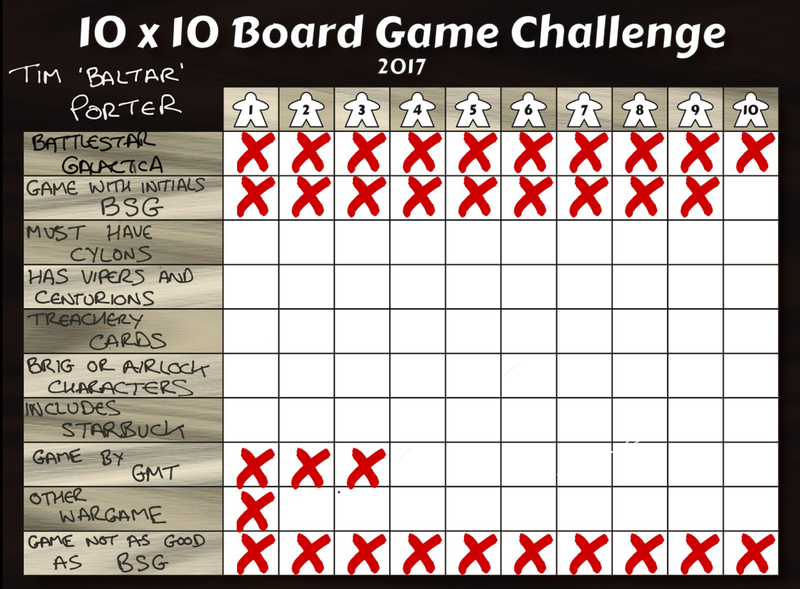 The standard 10×10 challenge is to play 10 different games a total of 10 times each. My version is a bit wonky. BSG is doing well, no surprise there. There should be little problem playing games by GMT Games. I need to focus on more “Other Wargames”. I own a lot of non-GMT published wargames, they just need to hit the table more.